As with the last post (which was swatched in the same night), my skin seemed to be more shinier and red on my nose than usual. Aside from the signature gold, the packaging is very different to the original EL DW frosted glass bottle; this comes in a "stick" form, which you can tell the true colour as the plastic tube is not frosted. The window that you can see the foundation through gets smaller as the product is used up; so the stick shortens as more is used. 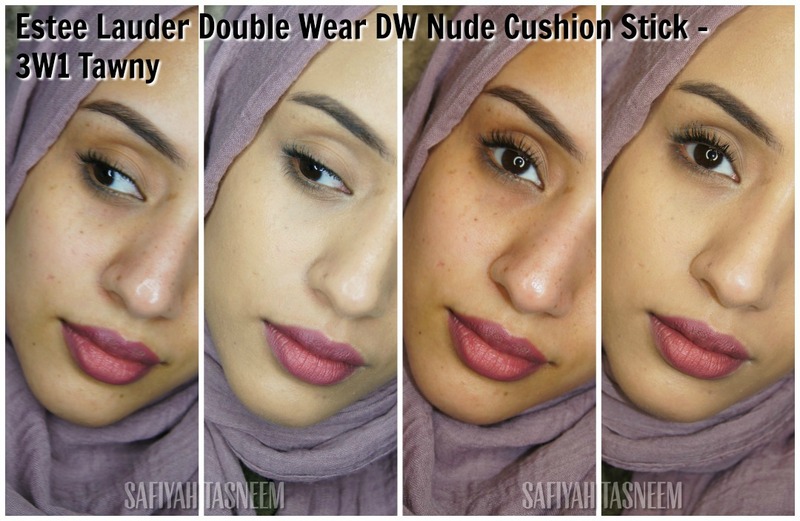 This design is described as a "pro tool" by Estee Lauder as it releases the liquid foundation when the base is twisted up, and can be buffed into the skin with the sponge top end. Be sure to slowly twist as too much product can be released and therefore more is wasted. There aren't as many shades as the original Double Wear (of course), however the two key shades I am in DW (Rattan/Tawny) were available in this too. I feel like these don't oxidise as much as the original Double Wear foundation, so I may even be able to wear 3W2 Cashew in this foundation. 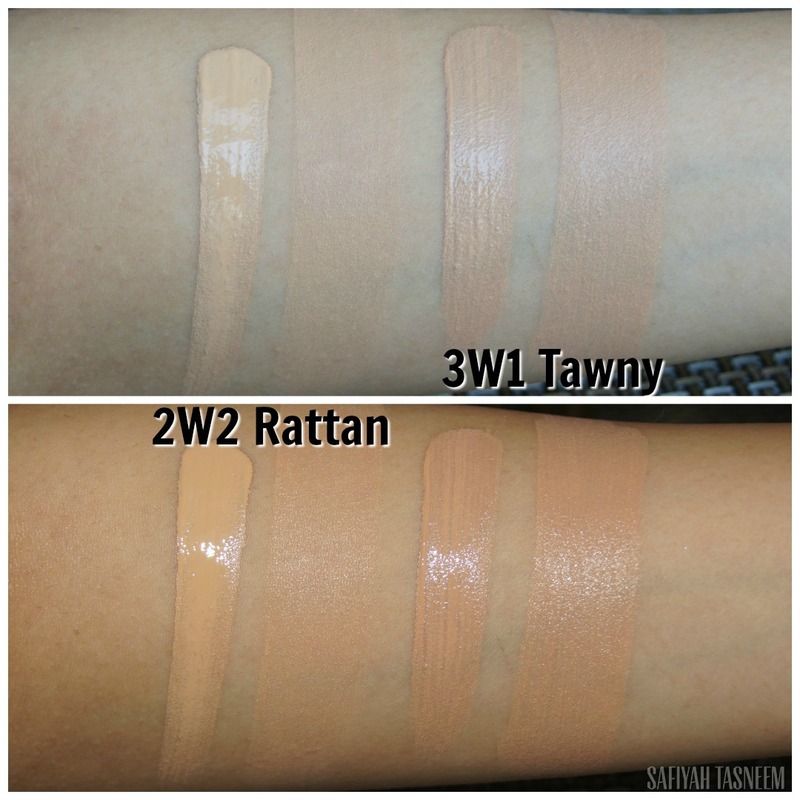 From the swatches above, you can see Rattan is again the yellowest out of the two of them (even though they're both "W" warm shades). Despite me liking the yellower shade, I felt like Rattan was too light for me in this formulation, and Tawny matches my lighter areas of the face/ Winter skintone (NC30). There doesn't seem to be any SPF included in these foundations which means it could be a good foundation to wear at night/going out and using flash photography as there should be no flashback. As mentioned in my Armani foundation post, my undertones are mostly yellow but have pinkness around my nose which can make it look like I have some neutral undertones but I am in fact yellower, especially when looking at my arms etc. 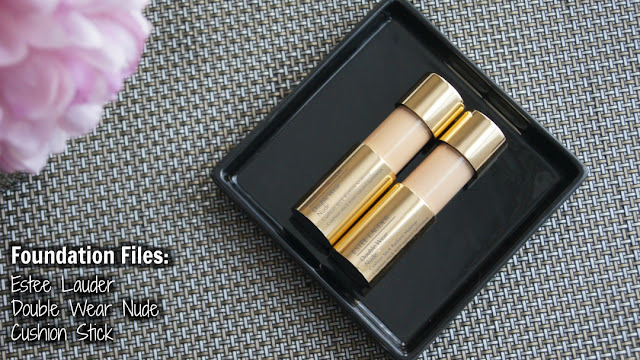 This is a sheer coverage foundation, but described as a "sheer to medium buildable" foundation. Hides my freckles and dark circles/scar veryyyy lightly, my skin still feels like it shows through. After it has been given time to dry down from initial application, it's still quite dewy looking (my nose looked hella shiny). It is described as a "radiant" finish which is definitely true due to this non-matte finish. I'd say this foundation is best for very dry to dry skin types although if I were to wear this I could get away with powdering well around my nose to help it stay on longer/look less shiny. It's a very lightweight foundation, so perfect for those that don't like wearing base or those who usually wear tinted moisturisers or BB creams. Despite being a "liquid foundation", the consistency is a bit more solid than the original EL DW which is quite runny in comparison. The built in applicator itself can be handy to use but I prefer to use a beauty blender with this type of texture still. It can however add to the dewyness so maybe a buffing brush and then finishing with a beauty blender would work best. Estee Lauder claims it has an "8 hour staying power"
I've tested this a couple times now and don't feel like this product would last 8 hours at all on a combination or oily skinned person, even with powder touch ups. It may however have this longevity on very dry to dry skin types. At £28 (available here) it's still a high end price; however, this may be worth it if you want something easy to carry/touch up your makeup with and not a super heavy coverage. I'd suggest popping into your local department store like John Lewis or House of Fraser to get a shade match as there are a fair few! If I had my old drier skin from a couple years ago, I probably would have loved this foundation and given it a 4.5 minimum. Now however, with my oily nose I need foundations that aren't dewy or radiant as they tend to separate on my nose/draw attention to the oiliness! If you've tried this foundation, let me know what you think, especially if you have dry skin! HI! Thanks so much for this review! 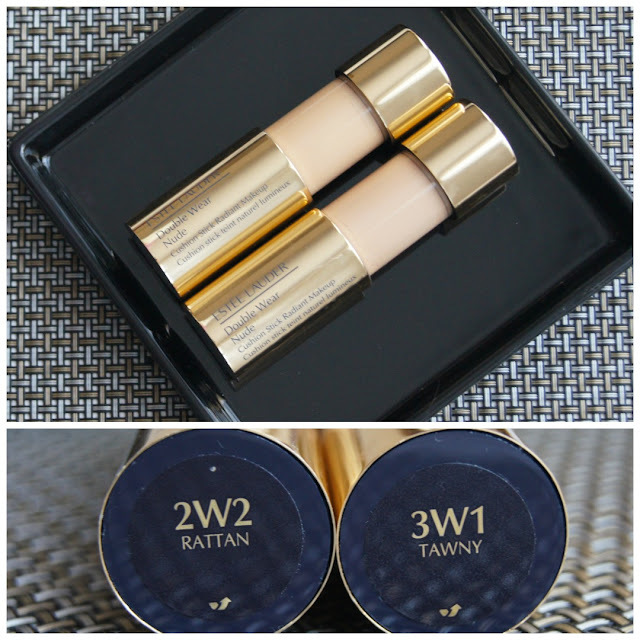 I am 2W2 rattan in every Estee Lauder foundation. 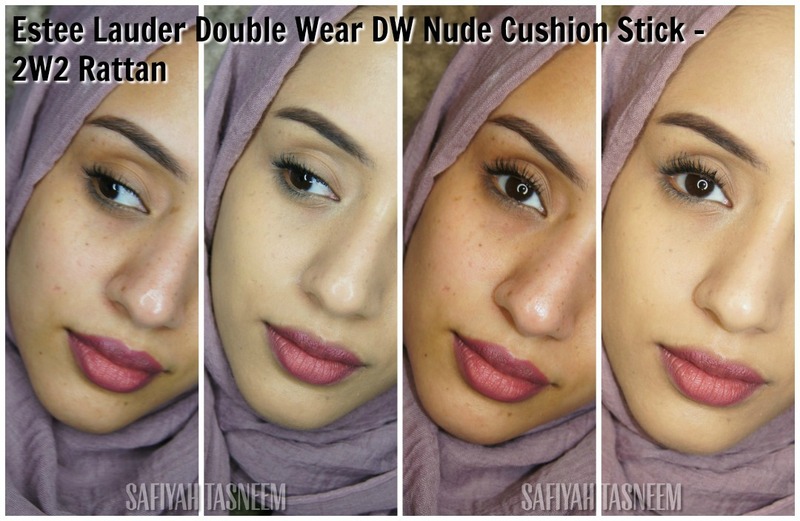 But I'm from the US and they don't sell cushion stick in 2W2 here, what a bummer. I was wondering if you still have this foundation? Where did you get it? I would appreciate your answer, thanks and have a blessed day!